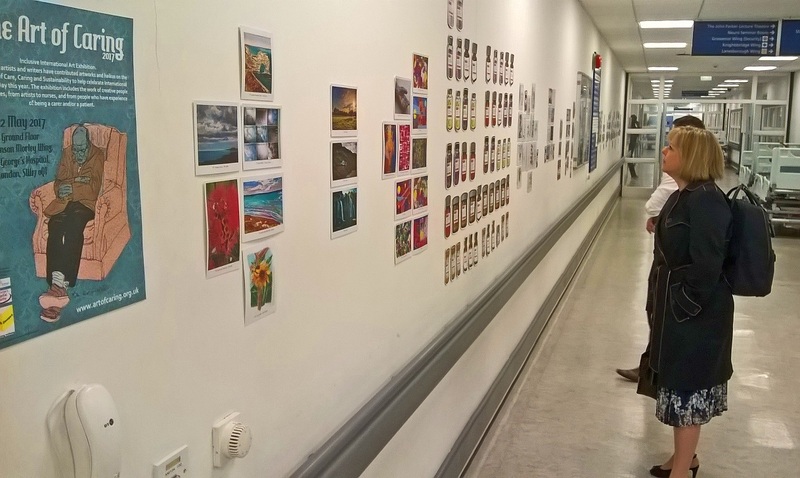 Yesterday we opened the Art of Caring 2017 exhibition at St George's Hospital. 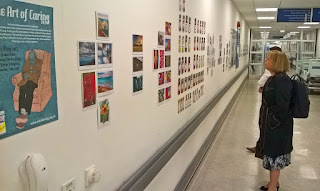 We had an immediate and favourable response from patients and staff at the hospital as they walked past our display of postcards and haiku pill bottles. 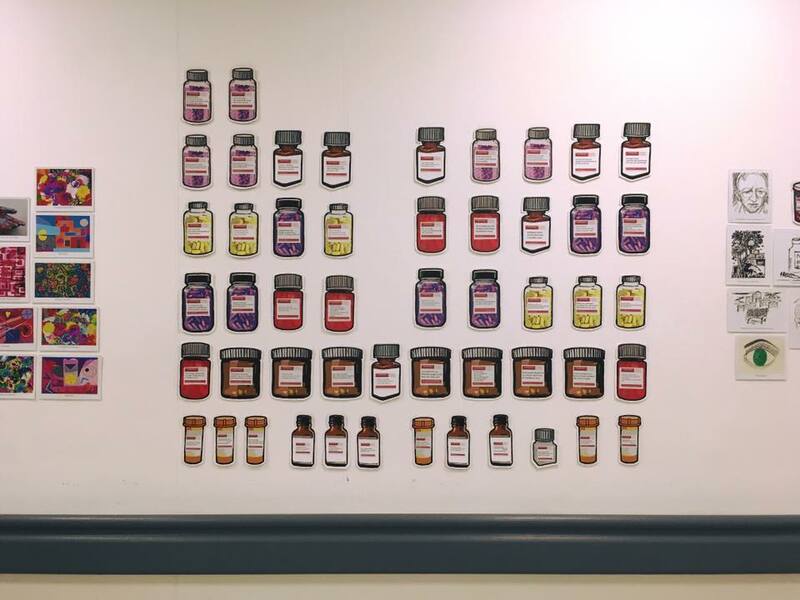 You can find the exhibition of more than 330 artworks by Cardiac Investigations, Ground Floor, Atkinson Morley Wing, St George's Hospital, SW17 0QT. 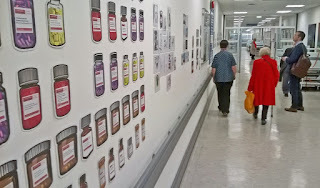 The exhibition is sited on a busy corridor that services several departments and if you sit there for a few minutes then porters swish by, pushing patients in beds and wheelchairs. While we were there several people spoke about the artwork on display. One of our first visitors Jill Partridge said, "I've been prodded and poked today, the staff have been wonderful but I've been to so many appointments and tests, it feels like I'm on a conveyor belt. How nice to have a moment to breathe. I like seeing the art, it helps me remember what is important to me." 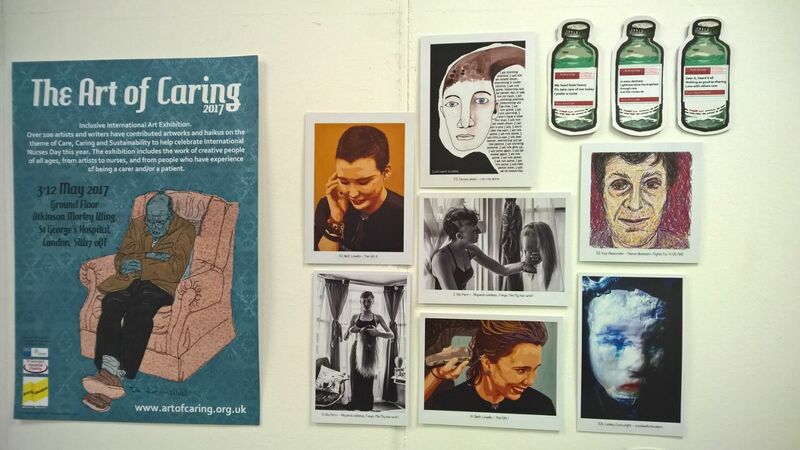 The Art of Caring is running alongside the SNAP Conference this year and many Kingston University Nursing students came to have a look at the art and find the haikus that they had written themselves. 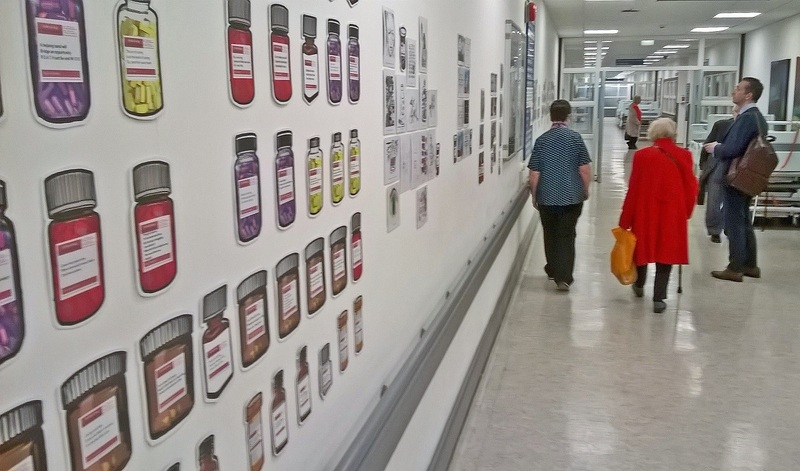 The haikus have been printed onto pill bottles and made a great display, a big thank you to ICU Nurse Nikki Yun and Dr Karen Norman who helped install the work on the Atkinson Morley Wing walls. We also had a important visitor, Jane Cummings, who is the Chief Nurse at NHS England. She viewed the whole exhibition and enjoyed the diversity of the work. Thank you to Dr Julia Gale and all the staff at Kingston University and St George's University, London for supporting the exhibition. Also to the Arts Director Joanna Wakefield and Curator Carla Di Grazia, both at St George's Hospital. Most all thank you to all the artists and authors who contributed to the exhibition, we rely on your support every year and you give us such a wonderful creative response. There is an additional album of photos HERE (and we'll add to them as the exhibition progresses). The exhibition closes on the 12th May. International Nurses Day. ATS writing is not so easy . You can do this easily when you follow some rules of it. This blog do this same work. This blog just advised you, that how to make it easier. If you need more information ,then you can visit this site. Excellent information you’ve got right here on this post. Thanks for sharing. 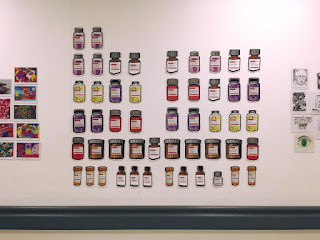 Awesome Post, Very important information about caring art of hospital. The Art of Caring is running alongside the SNAP Conference this year and many Kingston University Nursing students came to have a look at the civil engineering statement of purpose art. This information should helpful for nursing students. Thanks..
As the faculty admissions letter is essential for schooling job, so too could be your announcement of purpose correspondence very important to graduate work. It's a vital section of one's admissions application. read here if you want to know more about the quality writing services.